Kenny will be there June 24 through 27. He'll have new PERFORMANCE and SIGNATURE models available to try as well as a lovely maple Torres FE-18 and New World models. Be sure to stop by our table. The PERFORMANCE models are a very comfortable modern guitars with a lot of power, flexibility and range for the serious player and professional at an accessible price. As you may know, every handmade guitar is different. After our guitars are strung the first time, like a maternity ward, we meet our new charges, sense those differences and speculate on their future. Depending on how long the new guitars hang around the showroom, we can appreciate how their sound changes as they start t0 mature. Sometimes an instrument may sound a bit muted on one string at first, and within a day or two, it locks into expectations. Sometimes a guitar is exceptional right out of the chute. #3029 is one of those SPECIAL ones. We have been informal about this kind of situation in the past, to the point of not bothering to mention it to anyone, even the buyer. After all, not everyone's tastes are the same, and we've established a level of expected excellence in our instruments we needn't tinker with. On the other hand, for those who might be interested, this brand-new lively guitar is really special already. It's unlikely we'll create any formal method of acknowledging this phenomenon in the future other a blog item, but we think you'll agree if you get a chance to play or buy it. When I first started playing classical guitar I was around 23 years old, and I wanted to do just two things — play Bach, and write music. So that's what I did. It was a limited diet, personally satisfying, but eventually I needed to branch out to learn more about guitar playing and a broader musical vocabulary. I did indeed write quite a bit of music in those days (the 1970's) but it has fallen by the wayside and is now lost in filing cabinets in my attic. I've wanted to get back to writing, but my standards are higher now, and it can be a lot of work to write music, especially good music, and I've been kind of busy. Jump to last January, I was in China and got an email from Randall Kohl. He was a student at UC Santa Cruz back when I was teaching there (1979-1982) and now he's a PhD and professor of music at the University in Jalapa Mexico. He recently got a grant to publish an anthology of American guitar music, and he asked me to contribute. I guess he was still thinking of me as the person I was then, which I'm mostly not, but I was flattered. I hadn't written anything in 30 years, but he suggested I could submit something from back then. That didn't seem quite right for me, so I immediately started on a new work. He gave me a deadline of May 1st, 3 months! And it worked! I started the piece late January, and now it's done. And I like it. It's titled "There and Gone", whatever that means. I'm learning to play it now. I know that seems odd, that I can't automatically play something I've written, but it's just not so easy. I have to break it down and learn it bit by bit, just as I would any other piece. It's hard but it's fun. I'm going to premier the piece on Sunday June 6th at the New Music Works Avant Garden Party, as well as playing some other pieces by my friends Andy York and James Kline. I'm a little nervous about it, but I've got to do it, that's what the music is for. Maybe you can come,there will be lots of other music and food and drink, it should be a great musical/garden event. 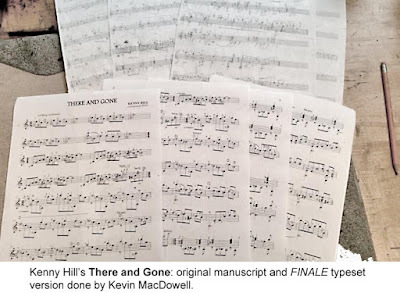 My friend Kevin MacDowell is doing the type setting of There and Gone in Finale, something I don't know how to do, and don't want to know how. It's brave of him to read my awful handwriting, and exciting to see this music come into print. It will be published in Kohl's anthology eventually, but in the meantime I'll be curious to see if anyone besides me learns it. Almer said he would, and I hope he does, he's such a great player. The cool side effect is that there are other pieces bubbling to the surface. I don't have a deadline in front of me now to force action, but maybe I'll stay focused enough to harvest some more music. It's an interesting process. It seems like music is just hanging in the air all around, and it just needs some kind of special instrument to dial in and capture it. A little time spent each day, and somehow miraculously the music takes shape. It's refreshing, satisfying.